Small in size but big on style, our eye-catching sets of dining tables and 4 chairs are perfect for smaller dining rooms. Our stunning sets of dining tables and 4 chairs are small yet strong and are ideal for kitchen dining spaces and smaller dining rooms. Able to seat up to four people, each set comes built from solid oak, mango or painted hardwood, ensuring quality designed to last a lifetime. 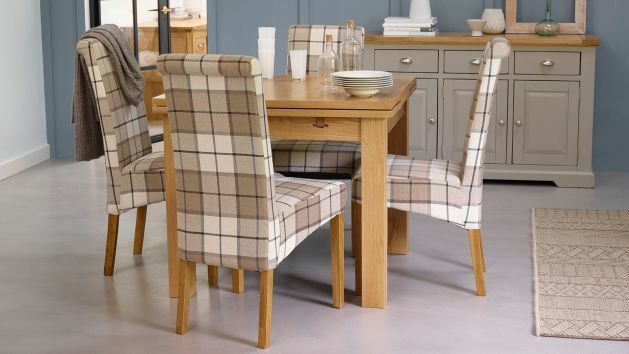 With round, square, and extendable space saving dining table and chairs sets available in a range of stunning designs and finishes, you’re bound to find your dream dining set at Oak Furnitureland. Whether you choose a set finished in luxurious leather or soft patterned fabric, you can be sure your family can enjoy meals in comfort and style. Each of our small dining table sets are built using robust, premium grade-A hardwood timber, and can stand up to even the largest of meals. Need some extra space? If you tend to host friends and family our extendable dining table and chairs can give you the luxury of extra space required to seat additional guests. With high back dining chairs upholstered in soft fabrics in a variety of colours, as well as premium leather, you can pick a style that perfectly complements the rest of your dining room. Will you go for a plush fabric in sage, light grey, charcoal or beige? Or, does a dark brown or white leather back chair set blend well into your design scheme? We take painstaking care to ensure each set of dining table and chairs can withstand the wear and tear of even the busiest households. However, you can help extend the life of your furniture with a little extra TLC. This can be achieved by placing tablecloths and placemats on your dining table, and coasters under cups and glasses to avoid stains. Invest in some Clear Wax Polish and you can nourish and protect wooden furniture, allowing it to be enjoyed year after year. Read our dining room furniture guide for more on for getting the best out of your dining room furniture. To make life that little bit easier for you, we provide free delivery to any room of your choice on all our dining table and chairs. Spend over £500 and you can split the cost of your furniture into affordable payments up to four years and enjoy 0% interest-free credit for up to three years when you spend a minimum of £3,500.